Once log or wood surfaces are clean, preserve them to protect against fungal decay and insect damage. Borate-based products are effective and inexpensive. IMPEL Rods, another form of borate, offer protection against internal decay of logs. 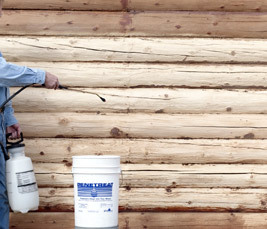 Spray-on water-based borate log home preservative. Rot and beetles and termites – oh my! 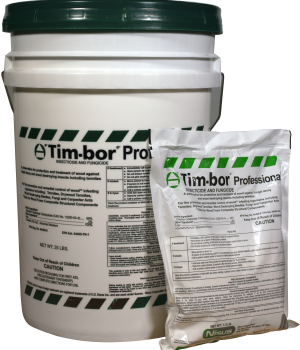 Tim-bor® is the inexpensive insurance every log and wood homeowner needs. When sprayed or brushed on bare wood, this borate-based log home preservative forms a protective shell to defend against rot and wood-ingesting insects. 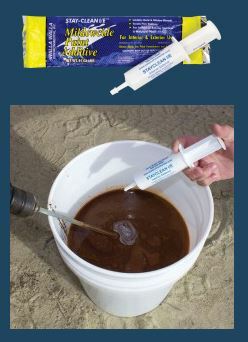 It’s easy to use and EPA-registered. Tim-bor® will not affect the color of wood and is chemically compatible with all of Sashco’s stain, caulking and chinking products. It costs five times less than its glycol-based counterparts, yet does not sacrifice protection.